Manager Lee Baker had some serious selection issues, being unable to call upon the services of Josh Westwood, Kieran O’Connor, Jack Swindlehurst and Jake Salisbury, while Jonny Hothersall was only fit enough to make the bench. On a brighter note, Dan Birch was able to make his long-awaited return from injury to the starting XI. The first 15 minutes gave no inkling of what was to come as Garstang, despite being down to a threadbare squad, looked their usual threatening self and had a number of chances. It was the visitors who took the lead against the run of play as a corner was only half-cleared to Henok Mukendi on the edge of the box, where he unleashed a bullet of a volley past Will Kitchen. Garstang dusted themselves down when Billy Akrigg and Ryan Cattermole combined nicely for Alan Coar to equalise with a smart header that wrongfooted the visitors’ keeper, Ryan Kirkman. On the stroke of half-time, another excellent Riverside crowd saw Kirkman produce probably the best save seen at the Riverside for years. Shaun Sailor broke down the right and whipped in a fantastic cross which was met firmly by Coar, whose header from point-blank range looked a goal. However, from nowhere, the Atherton keeper got across the full length of the goal and tipped it over at full stretch. At the restart Baker made a tactical change, replacing Tom Graham with Billy McKenna and playing two up front. However, within 50 seconds of the restart, the Garstang defence had gone to sleep and Atherton extended their lead from close range through Gary Burnett. This seem to spur on the visitors and Garstang’s play was becoming scrappy as they started to look suspect defensively. 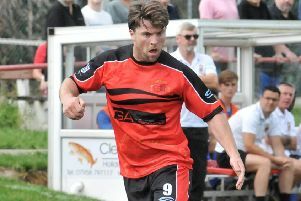 To no-one’s surprise Atherton scored again from a set-piece as Martyn Parkinson made it 3-1 on 52 minutes. Coar got one back seven minutes later as Garstang looked to hunt for the equaliser. McKenna had a golden opportunity but, with the net at his mercy 18 yards out and the keeper not in his goal, he shot wide of the target. To make matters worse, Birch was fractionally late on a tackle and was eventually shown a red card. Down to 10 men, things went from bad to worse for the Riversiders as the visitors scored a fourth goal on the hour with Burnett curling a shot into the far corner. There were still talking points in the game when the visitors hit the bar with a header from close range and McKenna was cynically taken out by the keeper. To everyone’s surprise the referee only deemed it to be a yellow card offence. Sailor had to go off with a nasty-looking ankle injury, and with both substitutes used, Garstang had to play the remainder of the match with just nine players. The remaining minutes of the game saw the visitors looking to run down the clock at every opportunity and Garstang were unable to trouble the scoresheet again before full-time.